Travel Neck Pillow: Designed to prevent a stiff neck when sleeping in a sitting position. Scientifically proven ergonomic design provides the BEST SUPPORT simultaneously to the neck and head to help you get totally comfortable and fall asleep. The BEST Memory Foam Travel Pillow for Airplanes: Perfect neck pillow for airplane travel; also ideal for all forms of travel – car, bus ride, or train.The MOST PORTABLE Memory Foam Travel Pillow: Ultraportable, easily compressed into the included bag (dimensions 10X5X4 in). Perfect Balance: Countless densities have been tested to ensure the perfect balance between soft and supportive, and to ensure the firmness and consistency that terrible plane sleepers require.Stay Cool: 4-leg design allows for far more air circulation compared to other travel neck pillows. Multi Positions: For sleeping when the seat is at an incline, for lying face down on a bed, and for napping face down on a desk, the travel pillow with H-shaped design provides the optimal answer. Please take a good look at the product video and you will be convinced. Removable and Washable Cover: Machine washable, hypoallergenic.30-day trial offer. We are confident that you will love the travel pillow. But if you are not 100% satisfied, you can return the travel pillow for a full refund – no questions asked. The optimal travel pillow for sleeping in a sitting position is finally here! All other popular travel pillows have been tested. 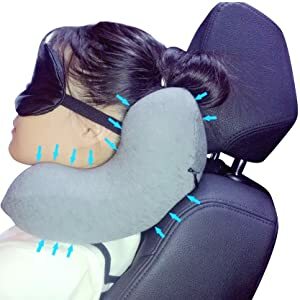 Sadly, none of them really provide optimal support to the neck and head simultaneously, which is crucial for getting totally comfortable and falling asleep when sleeping in a sitting position on airplane or car seat. With revolutionary design,this patented Ankaka A1 provides the BEST SUPPORT simultaneously to the neck/head/chin for you to get totally comfortable and fall asleep. The size and shape of the travel pillow is crafted to fit the average neck size of both adults and kids. The travel pillow gives kids a sense of security while perfectly supporting their neck and head simultaneously, especially during bumpy car rides. 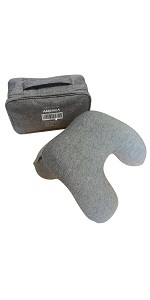 Ankaka A1 Travel Pillow is free of harmful chemicals, flame retardants, mercury, lead, heavy metals, phthalates, and formaldehyde. How to use it when sleeping in sitting position: Lean your head between the 2 shorter legs, then adjust the 2 longer legs to sit on your shoulders. If the seat does not recline at all, then choose the Ankaka T2 (Please see the chart below) instead, as it is the best travel pillow for sleeping upright. The Ankaka A1 is not designed for sleeping upright. It works best when the seat is at an incline. Other H-shaped pillows imitated from the A1 are similar to its prototypes. When sleeping in a sitting position, their memory foam is too dense to be able to settle into it as it lifts the head too much. After countless tests, the optimal density was found → Ankaka A1. It provides the perfect balance so that it is soft enough to be comfortable while firm enough to provide support.